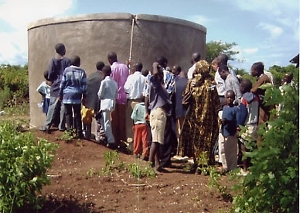 The area around Asembo Bay, north west of Kisumu, Kenya, suffered from a lack of decent drinking water. Most people survived on subsistence agriculture. We supported Pastor George McOmwanda and Kaloleni Church as they organised the digging of 3 wells (two around Ukwala and one at Oyoude) and the construction of one water tank (Madiany). These were handed over to local committees who had the responsibility to charge small fees for water to cover pump maintenance. 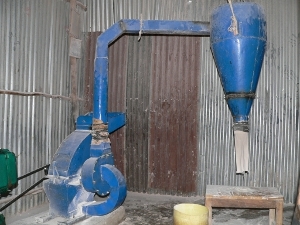 Similarly, two petrol driven posho (maize) mills were set up in corrugated tin buildings, and milling charges levied to cover fuel & maintenance. One of these mills has since become defunct, and was sold for parts. Since this time, the government has extended the water supply network to these areas. However, we have heard that people at Madiany still prefer to come to the well for better drinking water, using the supplied water for other things.